Wow, I can’t believe we’re already at Tewsletter number seven. Not a lot of newsletters get this far! If this were a TV show, it would be well into its first season, and likely getting renewed. Even though people would be confused because of its inconsistent delivery schedule. I went all of January without alcohol. I did it successfully. I learned very little about myself in the process, but I did lose four pounds. I lost that weight in the first two weeks and kind of plateaued. I assume I was just carrying four pounds of beer inside me at any given time. A longer abstinence might be necessary for any real results, but I don't want to abstain long enough to start thinking too clearly. The last three weeks were a real ride. Politically and personally. I was in San Francisco for a SeeSo taping (SeeSo is an NBC-owned streaming service for comedy. It's worth the subscription price if you don't have cable.) The taping was a blast and the show will be out in April. I also got to perform for the U.S. Coast Guard Academy in New London, CT, which was fun, but even after being out for so many years officers still make me nervous. After that I went back to Pennsylvania for a funeral, which was not funny or entertaining, but most funerals aren’t, even if the crowd is good. About twenty-four hours after that, I flew to Denmark for my little sister’s wedding. That was fun, funny, and entertaining, but the crowd was kind of small. Denmark is pretty chill. Put it on your bucket list maybe. Now I’m back in the U.S. and getting ready to do some more comedy. I’ll be at Hilarities in Cleveland next week, and all over New York and elsewhere after that. You can see all my live dates on my site as I update them. 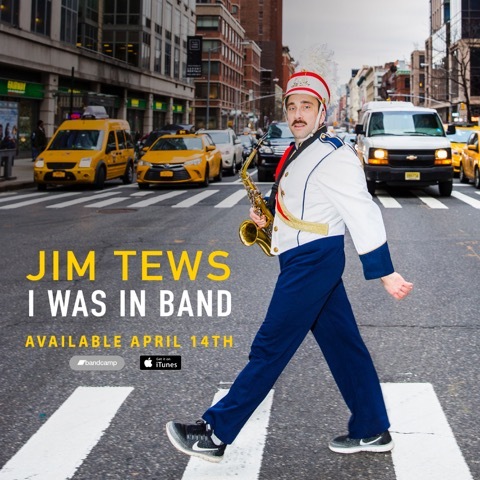 And my album “I Was In Band” comes out April 14th. Here's the cover! Thanks for subscribing! P. S. If you’re on this list, and don’t want to be, you can unsubscribe. I won’t even notice.